Our next concert, for solo and duo guitars, will be at the Friends Meeting House, Ship St., Brighton on Saturday 22 June 2019 at 3pm. The guitarists will be Jon Rattenbury and Brian Ashworth. On April 5th 2019 a concert – in collaboration with Music and Wine at St Luke’s – was given by Ivana Peranic (‘cello) and Rachel Fryer (piano) which included pieces for solo ‘cello by Phil Baker, Jonathan Clark, Patrick Harrex and John Hawkins followed by the Shostakovich Sonata for ‘Cello and Piano. 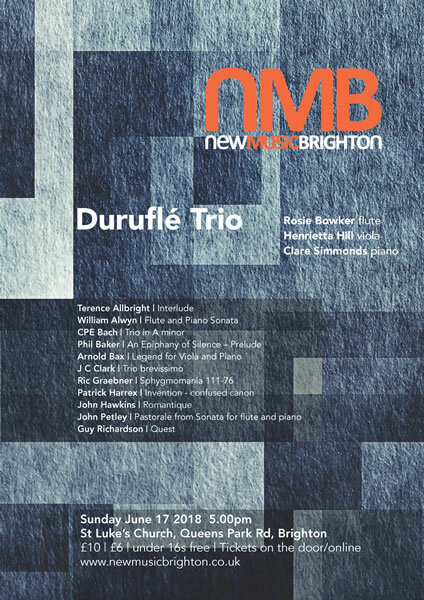 Our events for 2018 started with a concert given by The Duruflé Trio, flute, viola and piano, on June 17th at St Luke’s Church, Queen’s Park Road, Brighton. 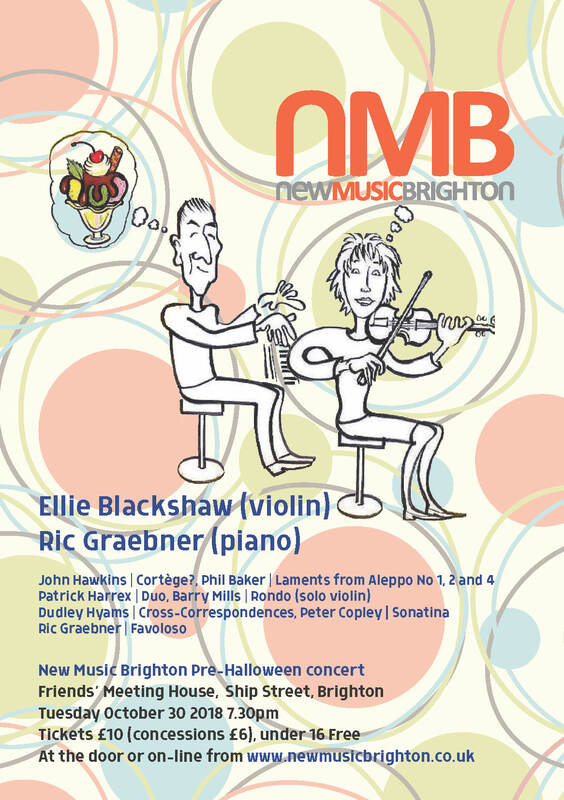 Several pieces by NMB composers were included in their programme. 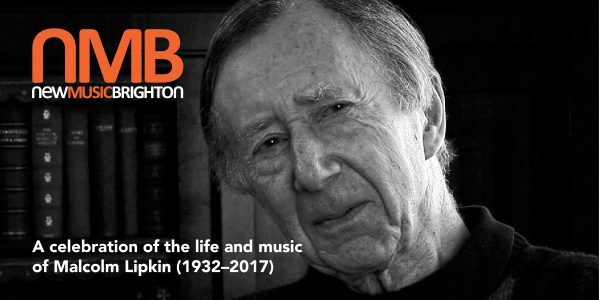 The second event was a memorial concert for Malcolm Lipkin, one of our original members, who died in 2017. This took place on October 6th at St Anne’s Church, Lewes. Musicians within NMB performed a selection of Malcolm’s works. 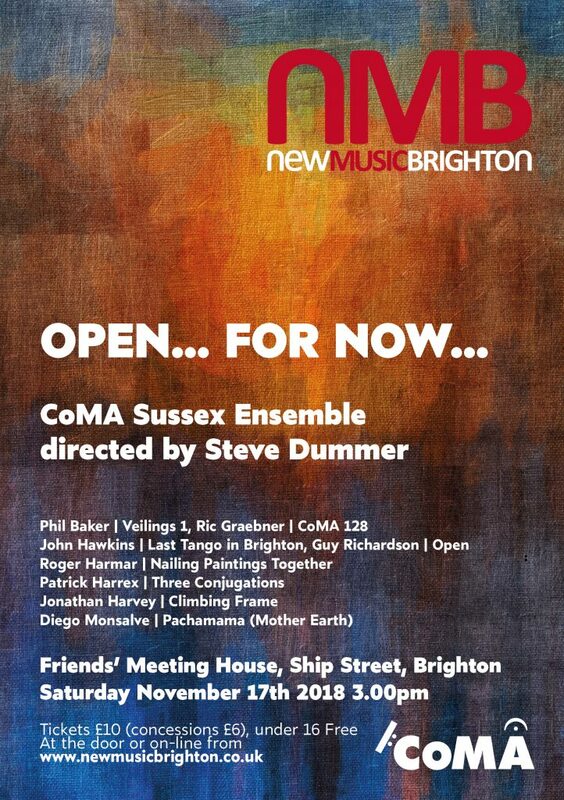 Our fourth event was a collaboration with CoMA (Contemporary Music for All) Sussex, an ensemble which includes musicians with a wide variety of abilities and who perform works using flexible instrumental and/or vocal line-ups. We were also in collaboration with the experimental clarinetist Luca Luciano to develop a project combining clarinet ( using extended techniques), dance, lighting and electronics. Performed by CoMA Sussex ensemble, directed by Steve Dummer.